You may not be an elderly at home person. But I want you to look around your own house. You have secret piles and stashes of clutter that no one knows about. You have your own logic for how things are stored. You know exactly where your bills are, and how things should be paid. Only in your mind is the secret order to the filing system for important documents like your bank account numbers or your will. All of it makes sense -- to you. Imagine someone coming in and wanting to have it all explained. Worse yet, THEY want to organize it. Heaven forbid they suggest something should be thrown away... the nerve! You've just entered the mind of your aging parents... with all your offers to help. But you know that if everything is not dealt with now, with their help, you get to deal with it later... without their help. Thankfully, someone has the expertise to help you now. Every day, thousands of Boomers are left with the house after their parents die. Thousands more move loved ones into nursing homes. More are just "down-sizing". However and whenever it happens, the task of dealing with your parents' house and all their stuff can be overwhelming. I haven't had to do it yet. I've just heard about the process with my now-deceased grandparents. Julie Hall's book would have been a most welcome addition. Scam artists and "thieves-in-nice-person's-clothing" can come out of the wood-work. Essential documents can be lost or destroyed. Mistakes can be made that will have enormous financial or tax consequences. Julie Hall's book can walk you through the process in a way that will keep you sane. She's lived through this with thousands of clients and has developed a system that will make it all make sense. She can help you talk to your parents now and begin the process of organizing your thoughts about what will need to be done and how to manage it. She can even help you avoid nasty fights with siblings. 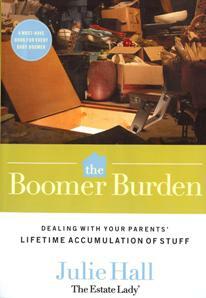 If you have an elderly at home parent, this book is a must-read.